Abstract. The Philonthus politus species group of the genus Philonthus Stephens, 1829 (Coleoptera: Staphylinidae) is revised, 47 species are recognized, 14 species are described as new: Philonthus amandava sp. nov. (Ethiopia), Philonthus ceryle sp. nov. (Cameroon), Philonthus conrava sp. nov. (Zimbabwe), Philonthus havai sp. nov. (Ethiopia), Philonthus lybius sp. nov. (Ethiopia), Philonthus mabuya sp. nov. (Kenya), Philonthus numida sp. nov. (Ethiopia), Philonthus ploceus sp. nov. (Zimbabwe), Philonthus sagittarius sp. nov. (Ethiopia), Philonthus tadarida sp. nov. (Malawi), Philonthus tchagra sp. nov. (Tanzania), Philonthus teleskopus sp. nov. (Burundi), Philonthus tringa sp. nov. (Republic of Central Africa), Philonthus zosterops sp. nov. (Zimbabwe). The remaining 33 species are redescribed: P. abdicans Tottenham, 1949 (South Africa), P. aethiops Bernhauer, 1915 (Ethiopia), P. affinis Roth, 1851 (Sudan), P. bicolor Fauvel, 1903 (Cameroon), P. bos Tottenham, 1962 (South Africa), P. carpenteri Bernhauer, 1937 (Uganda, Rwanda), P. chloropterus Bernhauer, 1939 (Kenya), P. cinctus Fauvel, 1905 (Ethiopia, Gambia, Namibia, Senegal, South Africa), P. excelsior Bernhauer, 1939 (Kenya), P. flavicauda Bernhauer, 1936 (Kenya, Democratic Republic of the Congo), P. gigas Bernhauer, 1915 (Ethiopia), P. haematodes Bernhauer, 1915 (Ethiopia), P. hospes Erichson, 1843, (Angola), P. impuncticollis Bernhauer, 1932 (Democratic Republic of the Congo), P. intermedius Lacordaire, 1835 (Democratic Republic of the Congo), P. jeanneli Bernhauer, 1939 (Kenya), P. kristenseni Bernhauer, 1915 (Ethiopia), P. malleus Tottenham, 1962 (Uganda), P. methneri Tottenham, 1962 (Tanzania), P. mirei Levasseur, 1967, (Cameroon), P. morio Boheman, 1848 (Angola, Bioko, Botswana, Central African Republic, Comoros, Congo, Ethiopia, Kenya, Malawi, Rwanda, Senegal, South Africa, Sudan, Tanzania), P. nimboides Tottenham, 1949 (Zimbabwe), P. pakanus Tottenham, 1962, (South Africa), P. phoculus Tottenham, 1949, (Ethiopia), P. rabidus Tottenham, 1962 (Tanzania), P. riftensis Fauvel, (Kenya), P. rugosipennis Chapman, 1939 (Kenya), P. scotti Bernhauer, 1931 (Ethiopia), P. tandalensis Bernhauer, 1939 (Kenya), P. tangamanus Tottenham, 1961 (Zimbabwe), P. torgos HromÃ¡dka, 2005, (Zimbabwe), P. vanhoofi Bernhauer, 1935 (Democratic Republic of the Congo, Rwanda), P. zaidius Tottenham, 1962 (Tanzania). An identification key to all species of the group is provided and male genitalia and significant morphological characters are illustrated. Holotype (male) 'Botswana, loc., Kutsaga near Harare airport, 18.iv.1997, [red oblong label printed] W. Rossi leg' (NMPC). where NMPC = National Museum, Praha, Czech Republic (Jiri Hajek). The location is in Zimbabwe, not in Botswana, as indicated on the specimen label (the author of the paper correctly lists the distribution of this beetle as Zimbabwe). Rove beetles (family Staphylinidae) are widely distributed insects in the order Coleoptera that are known for their usually elongated, slender bodies, their short elytra (wing covers). 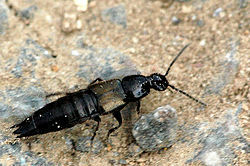 Rove beetles are usually found around decaying animal and vegetable matter, preying on carrion-feeding insects. Thus the new rove beetle was presumably found in the nest of a weaver, but Eastern Golden Weavers do not occur in Zimbabwe (nor Botswana), and Southern Masked Weaver is more likely although other species are possible. The beetle specimen was taken in April when weavers in Zimbabwe have generally completed breeding.